A recent poll conducted by Haaretz found that 42% of Israelis support the idea of annexing West Bank territory – with 19% backing full annexation without giving Palestinians political rights; 8% backing total annexation but giving Palestinians rights; and 12% supporting annexation of Area C alone. Map by Ir Amim. The section refers to area #6 on the map. Ir Amim reports that on March 19th, the Jerusalem Planning & Building Committee give final approval to two plans for a total of 13 new settlement units in the Sheikh Jarrah neighborhood of East Jerusalem. The planning for these units was previously fast-tracked by the committee in December 2018, and because the plans were initiated by private parties (the settlers), the plan will not have to go through the public tender process, meaning that building can start quickly. The last thing delaying construction is the court proceedings to evict five Palestinian families who live in a building that the plan calls to demolish. Ir Amim reports that on March 25th, the Jerusalem District Planning and Building Committee revisited a plan for a zipline park project in East Jerusalem promoted by the radical settler group Elad, for which the committee had already issued a building permit to Elad in March 2018. As FMEP reported last year, the process by which the committee issued the building permit was highly unusual — and, it turns out, illegal because the area in question is designated as a forest in Israel’s master plan for national forests. In hopes of finding a legal path around the national forest master plan, the Jerusalem Municipality stepped in to submit a request to the Jerusalem District Planning and Building Committee to designate the area as an “open public space” (which would allow building). If the project is implemented, it will be Israel’s longest zipline – coming in at 2,570 feet – and will travel over the Palestinian neighborhood Jabal al-Mukaber. 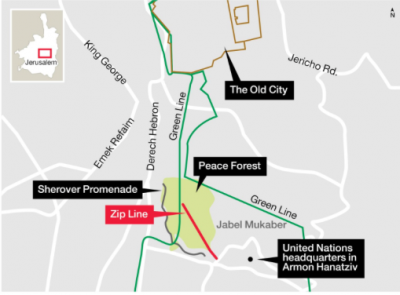 The zipline will connect two popular tourist sites in Jerusalem, the Armon Hanatziv promenade and the Peace Forest in the Abu Tor neighborhood. Ir Amim published updates to its 2019 map of Jerusalem of the settlement ring around Jerusalem’s Old City, along with detailed, comprehensive notes.